Well, Christie’s finally put both feet back into the 19th century arena; they had a standalone sale in early October. Now I know James and Deb did the best they could, but the fact that Christie’s decimated this department a few years ago made their job very difficult and sadly they discovered that the road ahead was still unpaved. When the dust settled, the market said that this time their best was just not good enough. When the catalog first arrived I had a feeling that the sale was in for a bit of trouble; and after viewing it I knew this was going to be a hard group of paintings to find buyers for. I did attend the actual sale and quickly, I am sure, it became painfully obvious to them that most buyers were really not interested in works that had condition/quality issue … at least that was the case on this day. Of the first 20 works offered, only 6 sold … had that continued it really would have been a BAD DAY and heads may have rolled! Luckily there was a little improvement. The sale consisted of 107 works that were broken down into small sections … these included genre paintings, Barbizon, Orientalist, Sporting (an almost dead market) and Marine. Taking top honors was Boldini‘s portrait of Marthe Regnier that brought $1.87M (est. $2-$3M). In second was a rather brownish Corot titled Nymphes et faunes that made $423K (est. $400-$600K); this painting last sold in 2004 (a much stronger period) for $680K — it also did not help that the painting was offered in an April 2010 sale where it went unsold with a $600-$800K estimate. In third place was a rather lackluster Bouguereau – The Muse – at $291K (est. $150-$250K – it last appeared on the market, back in 2005, with a $250-$350K estimate and did not sell). I will add that given the subject of this painting, the price achieved was a rather good one. As with every sale, there were some interesting paintings (at least few that I liked); among them were: a small piece by de Nittis, Portrait of a Gentleman…, that made $123K (est. $100-$150K) – not a very commercial painting, but for some reason I liked it; a rather freaky looking Gustave Dore titled La famille du saltimbanque… which brought $170,500 (est. $50-$70K and last on the market in 2007 when it sold for $48K); a nice Grimshaw featuring a Yorkshire lane in tones of green that made $255K (est. $200-$300K); a nice John Emms – Three Hounds and a Terrier… – that made $195K (est. $200-$300K); a small Lhermitte pastel which made $86,500 (est. $70-$90K and last sold in 2007 for $57,600) and Dawson‘s Taking a Northwester… at $267K (est. $180-$220K). And then there were those which had some real condition issues, whose estimates were not grounded in reality or were just not appealing to me – here are just a few: a large, rather poorly painted, Unterberger that failed to sell (est. $30-$50K) – thank goodness; a work by Benlliure y Gil which had a great subject matter (a group of figures on a balcony during a carnival) but really fell apart in the faces of the figures; it actually sold for $212,500 (est. $200-$300K); a Brunery (a real nice subject, but the panel was cracked in a few places) which failed to sell (est. $100-$150K); a rather monochromatic Lepine that sold for $68,500 (est. $40-$60K); a portrait by Corot of his nephew Camille Sennegon which had extensive pigment separation and was over-cleaned in areas … it failed to find a buyer (est. 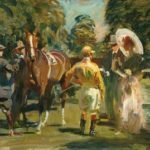 $250-$350K); and a slew of sporting paintings whose estimates harked back to a time when people were actually fighting over these works … as you will see, most did not find buyers. Now let’s get to the numbers. Of the 107 works offered 60 failed to sell, leaving a sell-through rate of just 44% – Yikes! The total take was just about $6.6M (with commissions) … they had expected more than $8M (without commissions). Drilling a little deeper: there were 16 works that fell into the Realist/Barbizon period and of those 10 sold (a 62.5% sell-through rate) … these included an early Ridgway Knight from the 1880s that made $194,500 (est. $100-$150K and last on the market in 1996 when it sold for $36,800) – I was surprised and very pleased with that result. There were 13 Orientalist pieces (no major works) and of those only 3 sold – a 23% sell-through rate … so Middle East oil money wasn’t going to save the day. 11 works fell into the British Victorian realm and 6 sold (54.5% sell-through rate … about typical for this sub-category right now). There were 14 sporting/animal works and only 5 of those sold (35.7% sell-through rate) and there were 7 marine paintings, 5 of which sold (71.4% sell-through rate). I even went so far as to break down the sold lots into those selling below the estimate (23), within the estimate (18) and above the estimate (6) … not really sure what that means since we all know the estimates are just that, estimates; but I had some free time so now you have those numbers! After viewing and attending the sale and then crunching the numbers here is my take: the best way to protect your money is to buy right; in other words, what you want to concentrate on are the best quality works that are in excellent condition. As we have seen from these results, mediocrity just does not cut it in a tough market – and we are in a tough market. Those works which were interesting did well for their owners … just look at the Dore, Ridgway Knight and Lhermitte. I will also be the first one to admit that if the economy were chugging along (as it was in 2007), many of the works in this sale would have found buyers – and some would have made fairly strong prices. November will have another test for our market when Sotheby’s offers their selection of 19th century paintings. From the catalog it looks pretty interesting, but as we know, the proof is in the pudding and then in the final numbers. I will add that I viewed this sale right before I printed this newsletter … and overall, the pudding looks pretty good.